Having a printer has now become a necessity in every home, office and business establishment. However, most people who use printers find that the ink in the printer ink cartridge gets exhausted all too soon necessitating replacement of the cartridge, which is an expensive proposition. It is essential to browse different websites and locate a reliable online source that provides Canon cartridges at affordable rates, particularly if you intend to buy in bulk. Online suppliers buy the HP deskjet cartridges and laser toner cartridges in bulk from manufacturers and give discounts to consumers because there are no overheads involved. Consumers can also opt for an inkjet refill kit and replace the ink in the used cartridge on their own using these kits. The process of replacement of the ink with the help of an inkjet refill kit involves siphoning the ink from a container and pumping it into the used cartridge. It is easy to refill the ink and the total cost of refilling will work out to about half of what you would spend on buying a cartridge. The printer warranty remains intact and does not get invalidated if you use an ink refill in your printer, as per the trade laws. An Ink refill kit contains all that is necessary to make the process of ink refilling as easy as possible. It includes ink bottles, syringes, and air balance clips that are necessary to even out the air trapped inside the cartridge so that there will be no obstruction in the flow of ink from the head of the cartridge at the time of printing. The kit also includes detailed instructions and illustrations which make it easy even for those who are not technically trained. It is recommended that cartridges should be refilled not more than ten times before the container is discarded. The frequency of refilling depends on the extent of usage of the cartridge and the type of paper used. Repeated refilling wears out the cartridge and makes it unusable after some time. Before using the inkjet refill kit, it is necessary to read the instructions carefully because the cartridge and printer might get damaged if you do not handle the kit properly. You have to be very careful when you refill color ink cartridges and ensure that you do not mix up the different colors. In order to refill different types of color ink, it is necessary to use separate injectors for each color. It is also important to handle the cartridge properly so that the print head does not get damaged. Ensure that the printing ink is compatible with the cartridge because an incompatible ink can clog the print head while low quality ink can splash all around the printer. 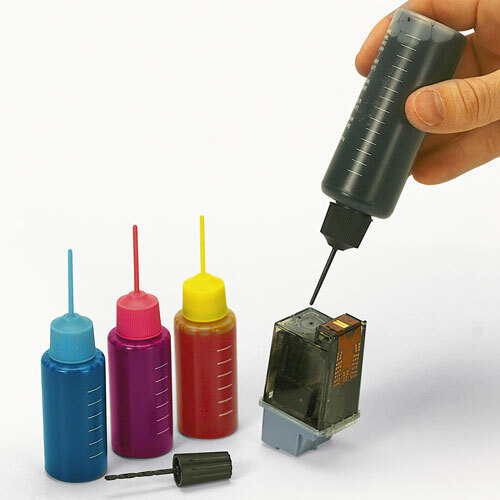 There are different types of ink refill kits available in the market. It is best to buy self-contained units so that there is no likelihood of any contact with the sensitive parts of the cartridge. There would also be no chance of any spillage of ink. Refilling the printer cartridge with the help of an inkjet refill kit will prove to be a cheaper option and the quality of printing will not suffer. However, whether you are buying a replacement cartridge or shopping for an inkjet refill kit, ensure that you find a reliable online source because spurious ink and cartridges can damage the printer and give low quality prints. ‎formujet sublimation ink | LFP ink cartridge | ‎formujet ciss ink | LFP ink | ‎formujet ciss | ‎formujet ink | ‎dye sublimation ink manufacturers | ‎ciss for plotter | ‎dye ink for plotter | ‎ciss manufacturer | ‎inktec sublimation ink | ‎sublimation ink suppliers | ‎heat press machine | ‎dye ink manufacturer | sublimation ink manufacturer | ‎formujet ink | formujet | continuous ink supply system | ‎dye ink for epson printers | formujet ink price | ‎inktec dye sublimation ink | inktec sublimation ink | ‎sublimation ink suppliers | ‎heat press machine in india .